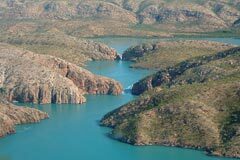 The Horizontal Falls are one of the most amazing natural features of the Kimberley region. The tidal waterfalls located deep within Talbot Bay in the Buccaneer Archipelago are unlike any other waterfall, the water passes horizontally. Although they are called waterfalls, this natural phenomenon actually consists of intense tidal currents hurtling through two narrow coastal gorges. Massive tidal movements create a waterfall effect as water banks up against one side of the narrow cliff passage, to be repeated again on the turning tide. The twin gaps are part of the McLarty Ranges, which have two ridges running parallel approximately 300 metres apart. The first and most seaward gap is about 20 metres wide and the second, most spectacular, gap is about 10 metres wide. It is possible to drive boats through the two gaps to the bay behind. The tides in this area have a 10 metre variation which occurs over six and a half hours from low tide to high tide and vice versa. The effect of the waterfalls is created by the tide building up in front of the gaps faster than it can flow through them and there can be a four metre high waterfall between the bays. The horizontal waterfall phenomena has been described by David Attenborough as “one of the greatest natural wonders of the world”. Normal high tides are caused by a bulge in the water covering the surface of the earth. High tides occur on both sides of the earth at the same time. The water on the side closest to the moon bulges out because it is being sucked by the gravitational force of the moon. The water on the side furthest away from the moon bulges out because it is being pushed by forces including the centrifugal force of the earth. At King Sound near Derby, the tides are influenced by the shape of the local coast. King Sound is an extension of the wide, shallow north-west continental shelf. This has a lot to do with why this area gets such huge tides. When the water comes in from deeper areas, it is constricted and squeezed by the shallow continental shelf. Because the volume of water is being constrained in this shallow region, the currents increase to try and move the water onto the shelf. The tide is therefore amplified as it moves shoreward. Tides at Broome are very high, at around 9 metres. But the tides are even higher in King Sound, because this area is shaped like a huge shallow channel. Here, the water is constrained on both sides and forced up the Sound, causing Kimberley’s bigest tides. 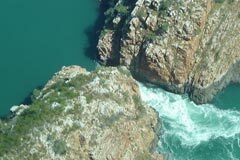 One of the the Kimberley's most unusual sights is the horizontal 'two-way' waterfall of Talbot Bay in the Buccaneer Archipelago.